Antlers at Vail is a pet friendly condominium / hotel. Cory from Snow Ventures located in Breckenridge sent us this picture of their Travel Agency’s mascot with the Antlers “Antlers”. That dog really looks happy. 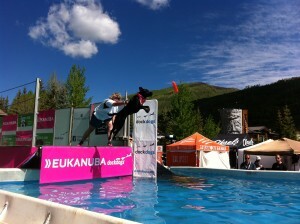 As a Vail pet friendly lodging option some of our four legged guests need some recognition too! Muffin one of our most loyal guests visited us again this March and as always it was a joy having her around. She never shies away from getting dressed up for any occasion, and always makes sure to stop by the front desk to show off her outfit of the day. We look forward to seeing her again along with the Bensingers, her gracious owners! Come visit us for a casual, funfilled afternoon celebrating the wintery breeds. Bring your Husky, Bernie, St. Bernard or Elkhound. Interlopers like Cavalier Kings, Min-Pins and yes, even wiener dogs will be graciously tolerated. Come one, come all. Have a cup of hot wine and a dog biscuit. You decide who gets what. Friday, December 17th from 2:00-5:00pm in the Antlers at Vail hotel courtyard. For those that need a room, we are offering a special with a twist. A mountain view Studio suite that night is $280. Instead of the normal $15 extra for pets, if you bring your dog it’s $15 LESS … $265. Free upgrade to a one-bedroom condo if requested. You’ll have to call us direct at 888-268-5377 to book this special day. Entry to event in the courtyard is free.